photos of the day NEW! 8 talks, 13 posters were presented. Thanks a lot for participation!! High-definition, or high-resolution measurements of earth surface topography and geophysical properties have often been performed for better understandings of its processes and dynamics. 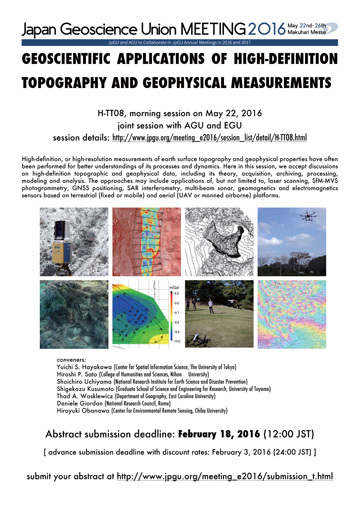 Here in this session, we accept discussions on high-definition topographic and geophysical data, including its theory, acquisition, archiving, processing, modeling and analysis. The approaches may include applications of, but not limited to, laser scanning, SfM-MVS photogrammetry, GNSS positioning, SAR interferometry, multi-beam sonar, geomagnetics and electromagnetics sensors based on terrestrial (fixed or mobile) and aerial (UAV or manned airborne) platforms.